I know that by January 5 many a new year resolution will have already been forgotten, but it is still early enough in the season of giving things up to be still thinking of, well, giving things up. I've always thought it would be lovely to find something that made surrendering bad habits more attractive. And I think I've found something that does that - a lovely boxed set called The Power of Surrender Cards. They are by Judith Orloff, who has also written a book called The Power of Surrender, which has the subtitle Let Go and Energize Your Relationships, Success, and Well-Being. I've not read it but based on the cards, which I've found quite inspirational since I started using them a week ago, I'm going to add it to my wish list. You can see some examples of the cards photographed above. They have really beautiful artwork as well as gorgeous gold edging and also feel a nice weight when you use them. The instructions come on just a single folded piece of paper inside the box, while the messages are printed on each card. Very easy to use. Just shuffle, think of a question such as, "What habit can I surrender to be happier?" then draw a card. You might need to spend some time thinking about what the message means to you, but I've generally found the cards I've drawn have been spot on. In one very interesting coincidence, I drew the card Surrender to Divine Timing, which shows the time 3.15pm. It was actually about that time when I drew it. More oddly, however, a friend then posted up on Facebook that he had woken up just after 3pm in the afternoon, following a night-long ritual, and how he was doing an experiment in following the natural rhythms of when his body wanted to eat, sleep, work and play. 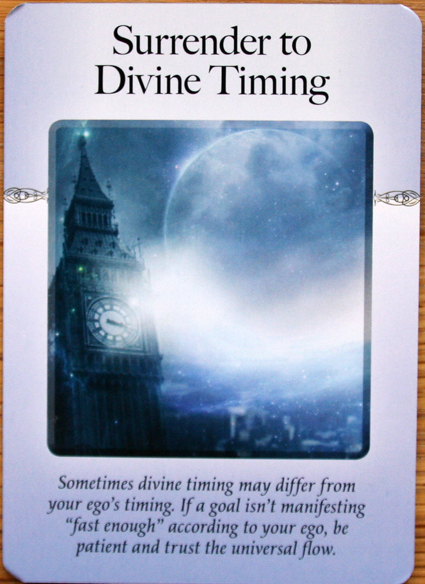 I have to add that I particularly like the card Surrender to Divine Timing because it shows London's famous clock Big Ben - another reference for anyone interested in tarots of London. Publisher Hay House says on its website: "Surrender is the divine art of letting go—the ability to flow instead of clenching, obsessing, and over-controlling. Use these 52 cards by Dr. Judith Orloff as an oracle to empower your choices. By consulting this deck and the companion instruction booklet, you’ll be able to choose the most positive outcome in any situation. Hay House added in a press release: "According to Dr Judith Orloff, the art of letting go is the secret key to manifesting power and success in all areas of life, including work, relationships, sexuality, radiant ageing and health and healing. Once embraced, surrendering removes roadblocks and the exhaustion that comes from 'trying too hard' - and it helps you achieve goals more effortlessly and brings ongoing happiness." The Power of Surrender Cards: A 52-Card Deck to Transform Your Life by Letting Go were published in December, but I suspect they are probably intended for plenty of use in the new year.